You are standing in the middle of downtown Florence in the vast and vacant Piazza della Repubblica, an echoing no-man’s-land bordered by oversized cafès, tourist shops and five-star hotels. There is hustle and bustle of a kind, but not the hustle and bustle of locals doing real things in the course of a real day. Tour groups shuffle from museum to church to museum, with the aimless aggressiveness of their sort. Taxis come and go, horns blaring, plowing through this supposedly pedestrianized zone. So, urban renewal struck with a vengeance and the ensuing century scarcely softened the shock of impact. But what ancient center? What former squalor? What alleged new life? TO BOW THEIR STUBBORN NECKS TO CHRIST’S LIGHT YOKE. Cities are defined as much by what is missing as by what is present. Two thousand years ago in this very place, there was the forum of the Roman colony of Florentia. 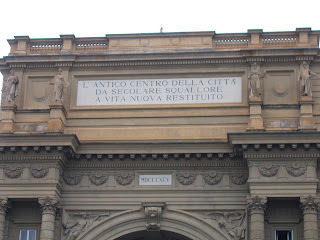 Then from the Middle Ages until nearly the present day, the Mercato Vecchio, Florence’s central market. And on the edge of this market, the Jewish Ghetto, as decreed by the Medici Grand Dukes of Tuscany. Scant traces of the Roman forum remain below ground. The central market has since moved twice—first to nearby San Lorenzo and then to distant Novoli. The Jewish Ghetto ceased to exist as a physical place more than a hundred years ago, when its buildings were razed in the late nineteenth century. It survives, however, as an historical fact and perhaps even as a state of mind. 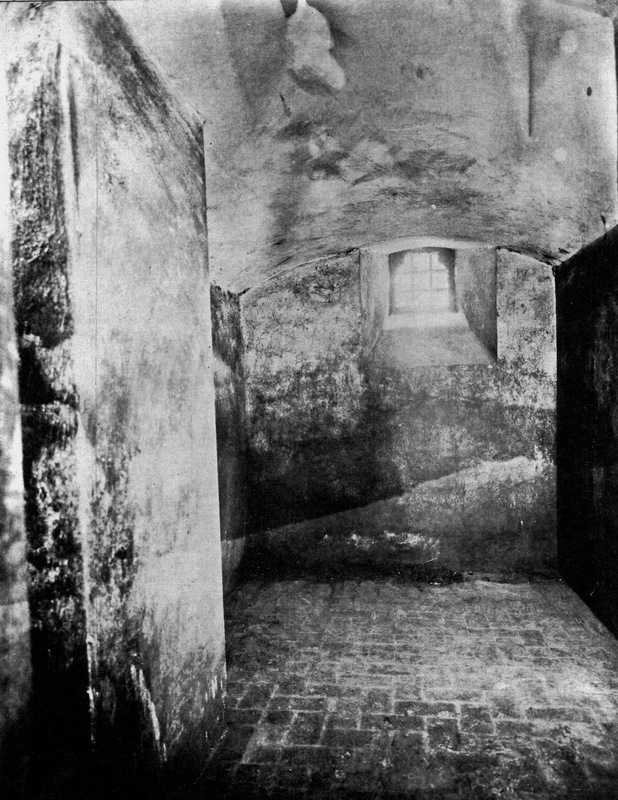 Rather than brick and stone, the primary evidence for the Florentine Ghetto now consists of words on paper, preserved for centuries in local archives— usually Christian archives, not those of the Jews themselves. For years, the leaders of the Jewish community periodically obliterated their own history, clearing out the old documents on their shelves to make space for new ones. 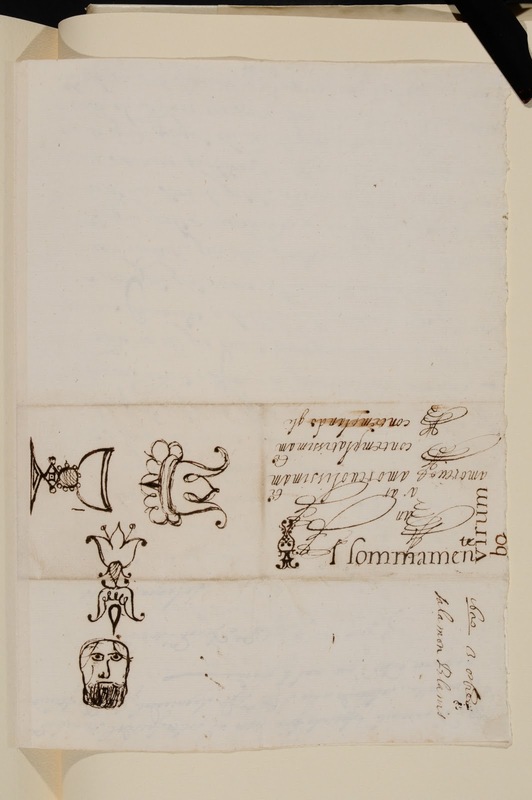 If we want to discover the Ghetto as it was and trace the lives of its inhabitants, the place to begin is the vast Medici Granducal Archive with its police files, judicial records, legal contracts, government deliberations and literally millions of letters. Sometimes there is an extraordinary trove waiting to be found —words on paper that seem to cancel the intervening centuries and bring us face to face with the past. Between 1615 and 1620, Benedetto Blanis (c.1580-c.1647), a Jewish scholar and businessman in the Florentine Ghetto, sent 196 letters to Don Giovanni dei Medici (1567-1621), an influential member of the ruling family. 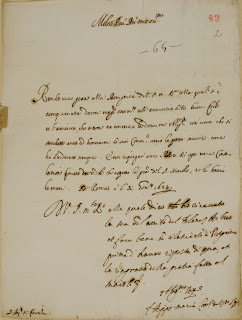 In the Medici Granducal Archive, we can read these letters more or less as Benedetto wrote them —in pen and ink, with all of the peculiarities of their time. 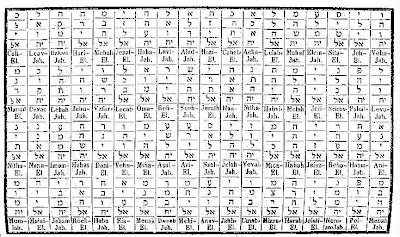 Now we can also read them in print, in a full critical edition—with transcriptions, footnotes and indices (in A Jew at the Medici Court: The Letters of Benedetto Blanis Hebreo (1615--21); University of Toronto Press, 2011). Here, in Jews and Magic in Medici Florence, we follow this same man on another archival journey —one that is longer, less direct and less clearly mapped. It takes us to the farthest reaches of the Medici Granducal Archive and then beyond —moving from document to document of every imaginable kind. Benedetto served Don Giovanni as librarian—managing his palace library, organizing and cataloguing its contents, acquiring books from various sources and sharing his patron’s most recondite interests. Together they ventured into dangerous and often forbidden territory—astrology, alchemy and the Kabbalah. Along the way, we see Benedetto Blanis living life on the edge, in a strange no-man’s-land between the Ghetto and the Medici Court. He was a scholar by choice but a businessman by necessity and his commercial ventures—especially loan-sharking and debt-collection—made him many enemies. Benedetto’s worst foes were other Jews and the very worst his own in-laws and cousins—recent converts to Catholicism. Benedetto may have been a good Jew or he may have been a bad one, but he was undeniably a brilliant and provocative individual. 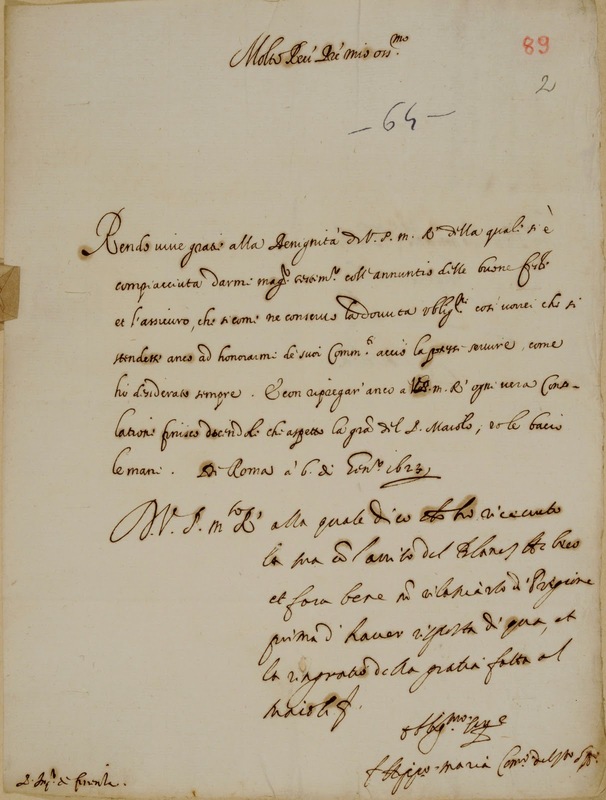 Thanks to his personal letters and a host of other documents in the Medici Granducal Archive, we can follow him closely, day by day, as he struggled to make a life for himself against daunting odds. 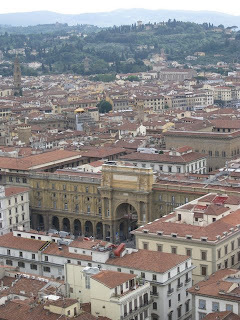 - Aerial view of Piazza della Repubblica, former site of the Florentine Ghetto and the Mercato Vecchio (Central Market). 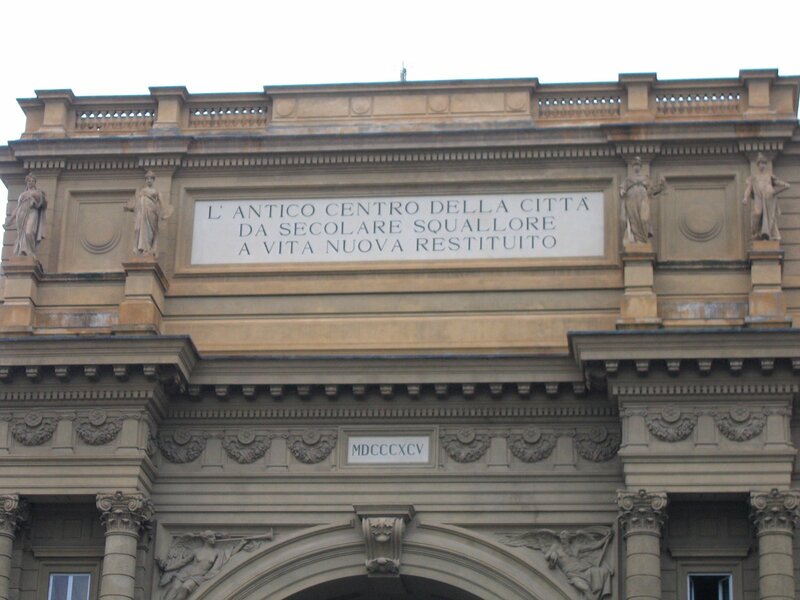 - Inscription on the triumphal arch in Piazza della Repubblica. - Arms of Cosimo I dei Medici as Duke of Florence and Siena (before he assumed the title of Grand Duke of Tuscany). 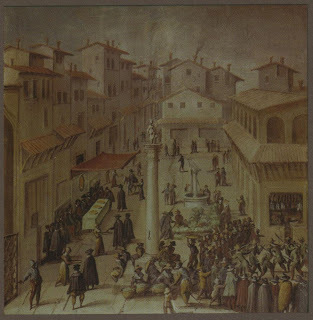 - Giovanni Stradano, Scene in the Mercato Vecchio (adjacent to the Florentine Ghetto) from a fresco in the Palazzo Vecchio. - Stefano Buonsignori's map of Florence from the time of Benedetto Blanis (detail), showing the area from the Cathedral and Baptistry (upper left) to the Mercato Vecchio (lower right). The Ghetto is immediately to the left of the Market Pavillion (number 225) — with two gates, a piazza, a well and one street. 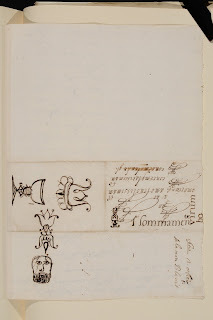 - A letter from Salamone Blanis (Benedetto’s brother)—with casual drawings by Don Giovanni dei Medici or his secretary, including a bearded Jew (Florence, Archivio di Stato). 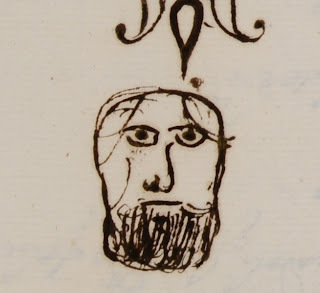 - Detail of the bearded Jew. 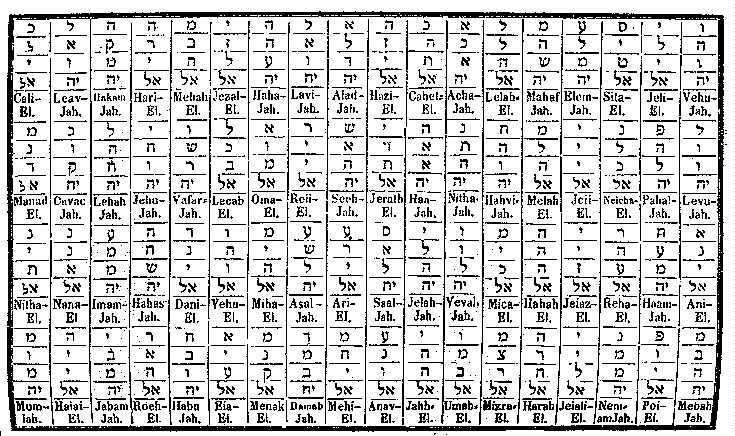 - Table from Cornelius Agrippa's De Occulta Philosophia. - A holiday greeting from the Commissioner of the Holy Office in Rome to the Father Inquisitor in Florence; “You would do well not to release the Jew Blanes from prison until you hear from us” (Florence, Archivio Arcivescovile). - "Blanes Hebreo" = Blanis the Jew. - One of the isolation cells in the Bargello Prison where Benedetto Blanes spent several years (Florence, Gabinetto Fotografico).